Why does BCR like native plants so much? We all know about our chronic water shortage. Native California plants, especially those suited to the location you’re going to plant them, need far less water than all those plants with huge, gorgeous flowers and high-maintenance grassy lawns. Once established, they can usually survive just with the rain they get during our rainy season. During the hot summers, they often go dormant until the rains come again, when they spring back to life. In addition, they don’t need fertilizers or insecticides, since they’re used to the native soils and have few insect pests. Nor do they need herbicides for killing the weeds that inevitably spring up in lawns. Those lawn and yard chemicals contribute to the pollution in Ballona Creek when irrigation runs off into the street and storm drains, then enters the creek. The fertilizers also spur growth of algae, which deplete the creek water of oxygen, thus harming downstream fish and invertebrates that live in the mud. Finally, native plants attract native birds, pollinating bees and other beneficial insects. This ongoing project is located on the grounds of the Culver City High School and Middle School Athletic Field area, on a slope next to the Ballona Creek bikepath. Plant selection: In small after-school sessions, BCR and Culver City Middle and High School students developed a tentative plant palette based on plant and site characteristics. In general, they sought plants that were part of the historically predominant Coastal Sage Scrub plant community; worked well with varying soil conditions, and mostly sunny terrain; required little or moderate water; provided different seasonal colors and aromas; attracted birds, butterflies, and helpful insects; and, where possible, had some Native American use or meaning. This gratifying project is a 3-way collaboration between BCR, Friends of Ballona Wetlands, and the Mar Vista Family Center. The land is a slope located on LA County property adjacent to the Ballona Creek bikepath directly behind the MVFC’s new community building. 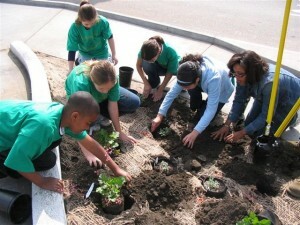 In June, 2011, local youth planted more than 100 native plants into a 90-foot-long area. Most of the heavy labor was performed by youth from the Los Angeles Conservation Corps, which prepared the rock-hard ground for planting with a rototiller and pick axes. The Corps’ primary mission is to provide at-risk young adults and school-aged youth with opportunities for success through job-skills training, education and work experience with an emphasis on conservation and service projects that benefit the community. 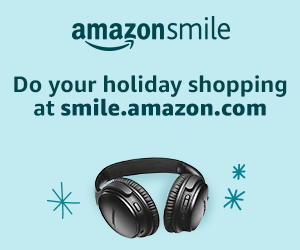 The mission of the Mar Vista Family Center is to provide low-income families with quality early-childhood education, youth enrichment and educational tools to create positive change in their lives and communities. The project was funded by the Southern California Wetlands Recovery Project under a grant from the Earth Island Institute. These projects involved both in-class education and actual planting experience at six sites along Ballona Creek in Culver City and Playa del Rey. Participating students and teachers were from Culver City Middle School and Farragut Elementary School in Culver City, Westside Leadership Magnet School in Venice, and Community Harvest Charter School in the West Adams area. Native plants and tools were provided by LA County staff, who also did the heavy work of planting trees. BCR served as fiscal agent and provided advice, outreach, plants and volunteers for the neighborhood’s creekside plantings, upgrades, cleanups, and art between Clyde and Burnside Avenues adjacent to the creek’s easternmost section. BCR assisted the Culver City/Lindberg Park neighborhood plantings at the pedestrian bridge with a native plant palette and outreach. 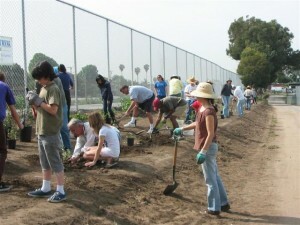 Starting in 2008, BCR “adopted” the community garden on LA County property at Mesmer Avenue, Beatrice Street, and Centinela Creek, including securing the needed insurance and permit.